During the Cider Summit in Chicago we had the opportunity to try the Perry in Uncle John’s premium line. 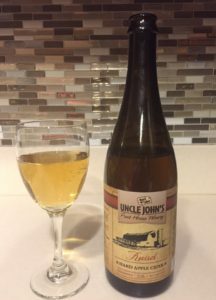 After the event we found Uncle John’s Farmhouse Russet Cider. Russet is the dull brown and rough finish on the skin of some apples. While apples with this skin are suitable for eating, in the US they are more often used for ciders and juices. These apples have bolder and sweeter flavors when compared to other cider apples. The Golden Russet, an apple first discovered in the early 1800s in Western New York State, is the predominant apple in this blend of 30 russet apples. The cider has some of the yeasty, vinegary notes found in UK ciders, but isn’t be overpowering. A rich golden color with a slight foamy head reminiscent of sparkling wine. The cider has clean apple aromas followed by a bit of yeastiness. The slight tart flavors are nicely balanced by the sweetness of the apple making this cider a pleasant drinker with a faintly drying finish. This cider is reminiscent of a young Chardonnay, a wine that has both the smell and flavor of fresh green apples. The yeasty and sour notes add a bit of complexity that most Chardonnay drinkers would likely enjoy.